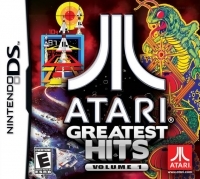 Description: Atari Greatest Hits Volume 1 delivers 50 iconic Atari games to the Nintendo DS. The compilation game simply gives you the best of Atari's arcade and 2600 games. With 50 all-time favorites including Pong, Asteroids, Centipede and Missile Command and available single cartridge multiplayer, the fun never ends for those who love the classic gaming experience! 12-03-2012 moonstarraven Description Atari Greatest Hits Volume 1 delivers 50 iconic Atari games to the Nintendo DS. The compilation game simply gives you the best of Atari's arcade and 2600 games. With 50 all-time favorites including Pong, Asteroids, Centipede and Missile Command and available single cartridge multiplayer, the fun never ends for those who love the classic gaming experience! This is a list of VGCollect users who have Atari Greatest Hits Volume 1 in their Collection. This is a list of VGCollect users who have Atari Greatest Hits Volume 1 in their Sell List. This is a list of VGCollect users who have Atari Greatest Hits Volume 1 in their Wish List.